May your all dreams come true and if you want them to be true, you better got yourself a dream catcher! Well, that’s what American Indians strongly believe in. 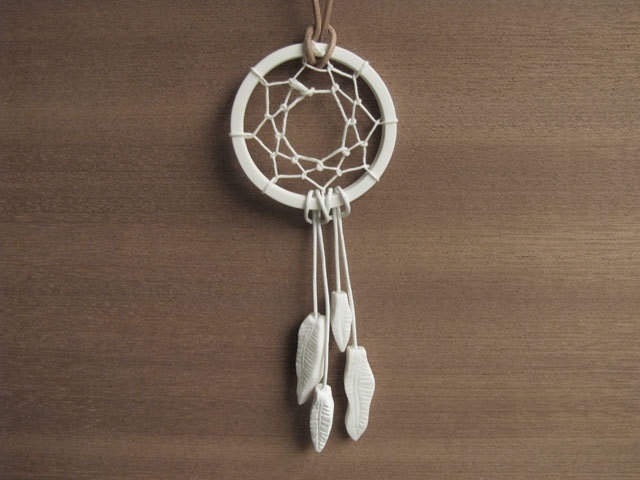 Yes, the word itself ‘Dream catcher’ which catches you good dreams is called dreamcatcher. You might have seen it in many houses for decore purpose but it’s more than that as it brings you positivity, happiness and all sacred energies. Wait! Have you just thought of making yourself one? 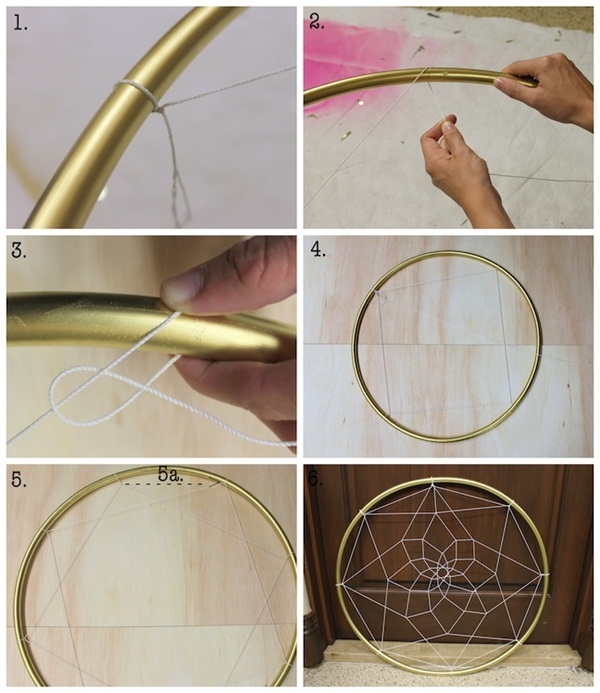 Well, then let’s guide you to this way, so you will get the answer of how to make your own dream catcher DIY. And you can hang it in your home or have it with you carrying in bag. 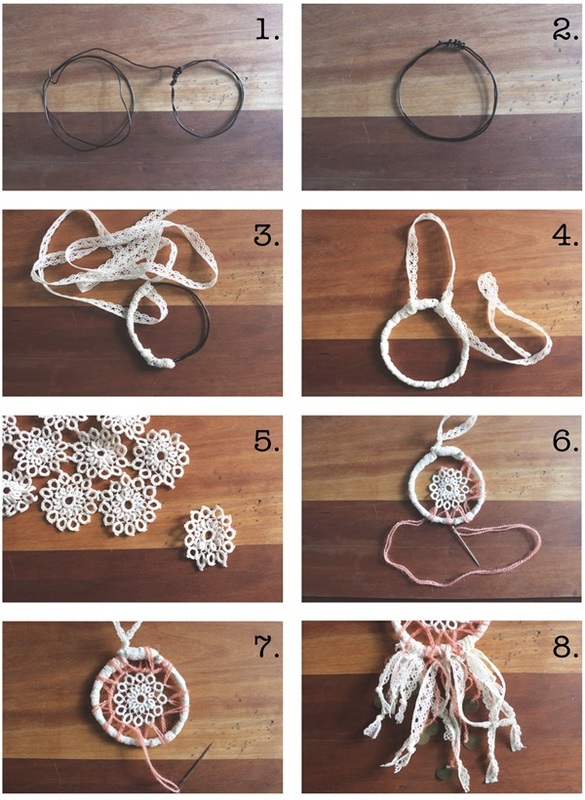 So, the best thing of DIY projects is that you can use things that you have at home, like rope, wire, paper and cardboards and so kids do love paper craft ideas. As these artworks can be shared with pals and you can gift them as well. You know, colors are also soothing and affect us in both ways positively and negatively. Adding blue feathers will make it look inviting and exotic. Just make sure to follow the steps while weaving the web. Don’t want to hang it anywhere in the house? Well, you can have it as a pendant and let it enhance your personality and fashion sense as well. Use fur and feather of small sizes and since it’s for your neck, make sure to use light weight hoop. 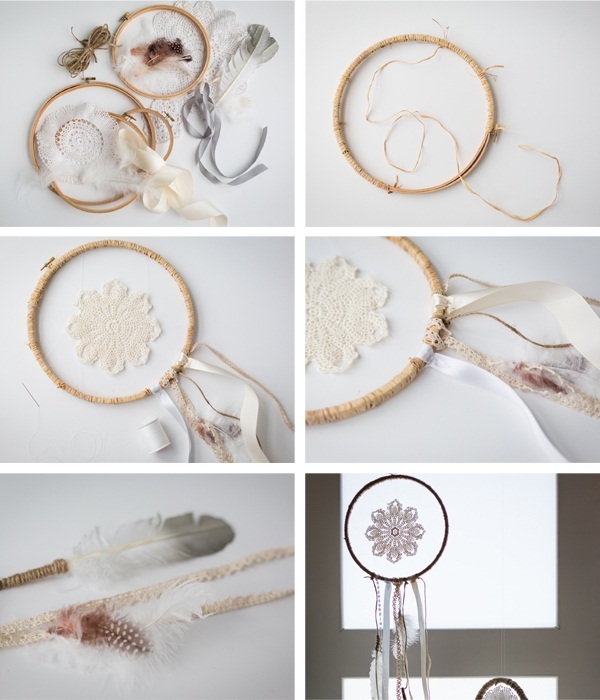 Grab some gems, embroidery floss, needle for threading beads and few metal hoops. 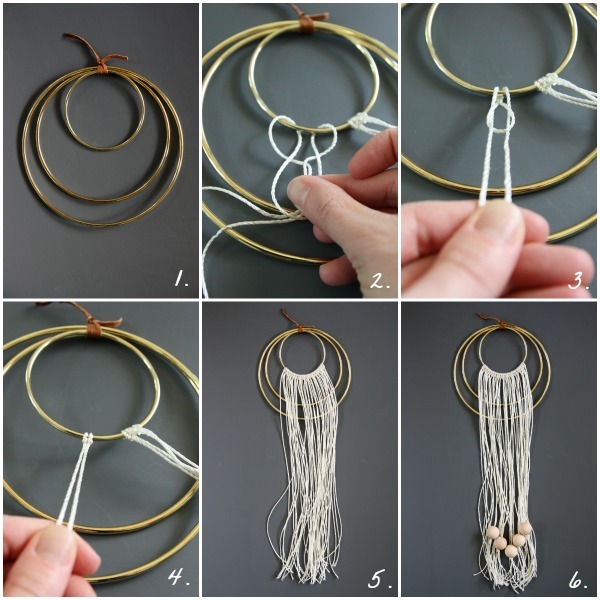 You can craft yourself as much as you want of different sizes as you got small to big sizes of hoop. Now, you may want something big to hang around you so it’ll move when the wind touches it. So grab yourself a big metallic hoop and don’t worry about the weight but light weight would be better as it’d make dream catcher to fly. 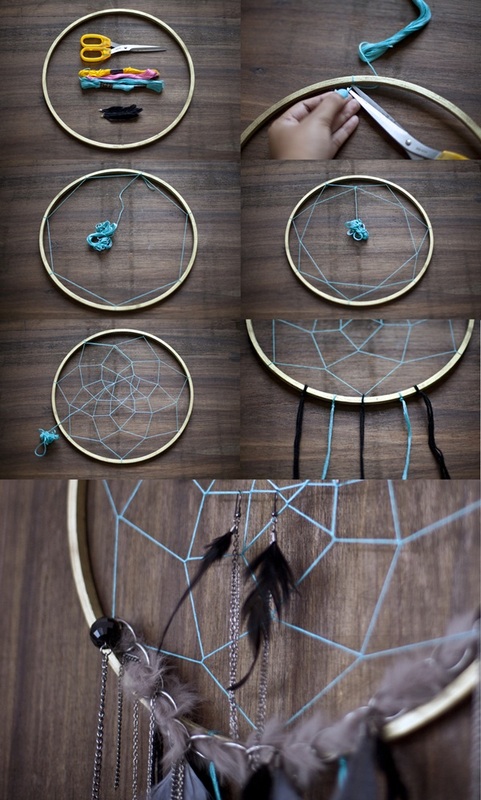 You got no idea about making dream catcher, no worries! 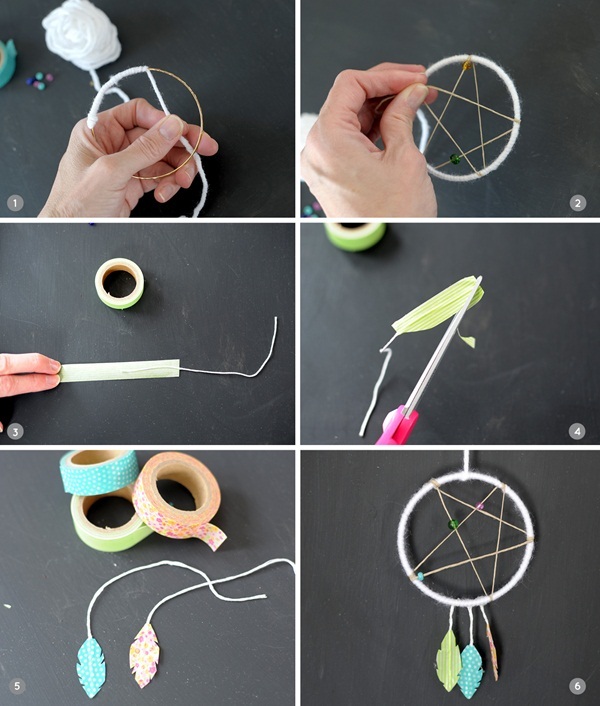 Just get the hoop, make a web by weaving the thread of any color that you want to use and once the weaving is done, do some décor work. Now, that’s unique and as we all always appreciate something creative here is it. When you’re about to craft the web just sue the flower and you can buy sued lacing as it looks more inviting and fresh. When you don’t have enough time to do the all work, just make the star shaped web as it’s shown in image and it’s done. You’ll be needing, scissor, pink colored wool and a wire or a hoop. 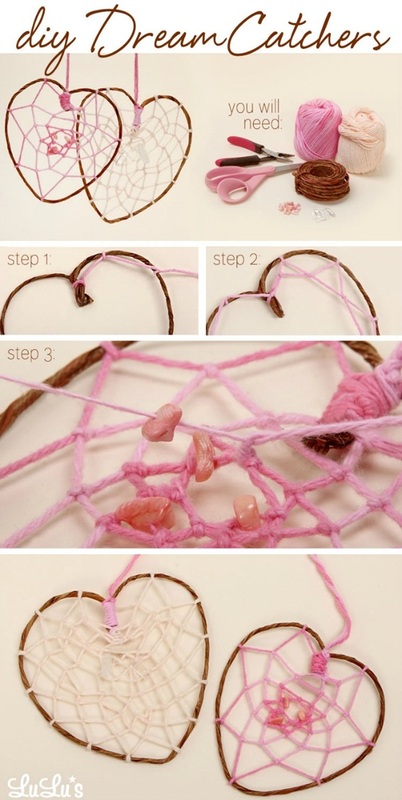 You can easily make the heart shape with wire, right? Now, start making web and don’t forget to add some decorate e elements. Well, it’s easy for kids too! Just help them and ask them to follow the instructions shown in the picture. 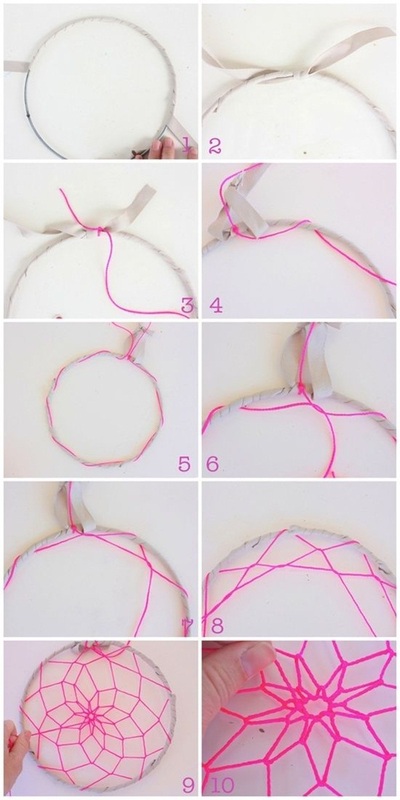 For the lacing, you can add colorful tape and no need to make complete web just go for the short and simple. Well, this may seem you Tough but is not at all! Little bit of practicing and hard work will get you this awesome masterpiece. Here,, web is quite complex but you got to use small needles and thin thread. 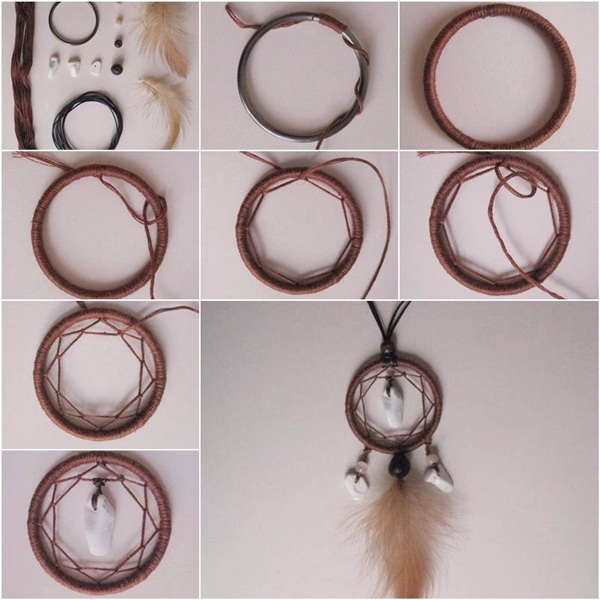 You know adding some strings, fur as a symbol of air through which the good dreams come to you and gem stones to represent the four directions would complete the design. Yes, you can use more than one hoops for unique and cool design and hoops must of smaller, medium and large size so it’d be easier to make the web. Get the wool, a wire and thin thread for lacing and craft the web design and it’s ready. Weave the woolen thread carefully and you got to do some sewing work also. Just with a while hoop, while thread it can be done in no time! Just follow the steps. Ahan! So adorable it is! It’s the web that catches the good dreams and conveys them to you. So make sure to use good quality of thread for making web. 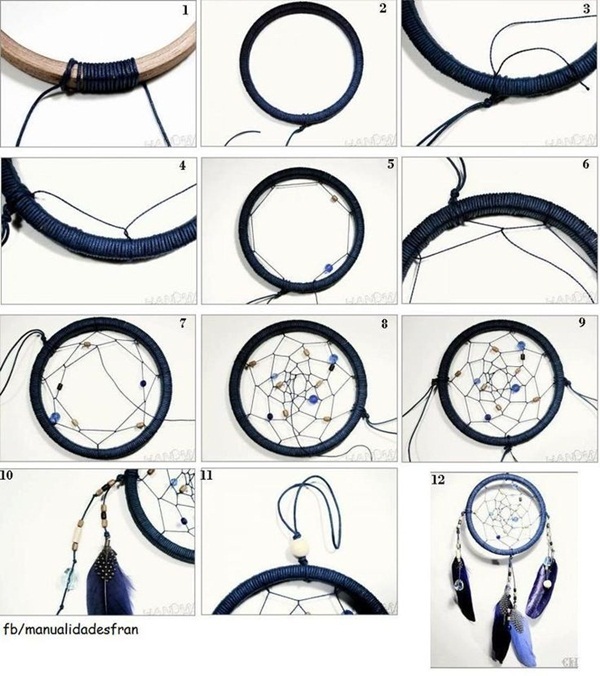 Hope you enjoyed the how to make your own dream catcher DIY ideas and do let us know your feedback in comment section.